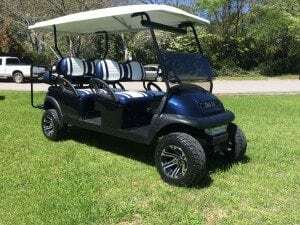 Custom Golf Carts Columbia is your place to shop for custom golf carts in South Carolina. Not only do we focus on customizing your golf cart, we can repair your golf cart or service it to keep it running top notch! Our certified technicians offer excellent customer service at a great price. We will diagnose your problem BEFORE we charge you. Need new batteries? Seat broken? Lights out? Call Custom Golf Carts Columbia at 803-941-7523 today to get your golf cart back on the road! Custom Golf Carts Columbia – Where are we located? Custom Golf Carts Columbia is conveniently located off of I-26 in beautiful Chapin, SC. We are easily accessible from I-20, I-77 and I-26 to better serve our Columbia customers and the surrounding areas. We do offer delivery and pick up services (additional fees apply). We are open Monday through Friday 8:30 – 5:30 and Saturday 9-2 to ensure all of our customers get the service they need! Call us today to schedule your appointment to build the cart of your dreams or bring in your custom golf cart for a tune-up!